We’re all familiar with GCSEs and A Levels from our education, which formed part of the National Qualifications Framework (NQF) until 2010. After this time, the NQF was replaced with the Qualifications and Credit Framework (QCF), which uses a set of rules to enable students to build up units resulting in qualifications. Upon completion of each unit, the student obtains credits which subsequently build up to qualifications. NVQs are being phased out and replaced with the QCF equivalent. More information on QCF and teaching assistant qualifications. Within the QCF, there are levels of qualifications which correspond to the NQF levels – QCF level 2 is usually the minimum required by schools for teaching assistants and is equivalent to the phased out *NVQ level 2 and GCSEs grade C and above. 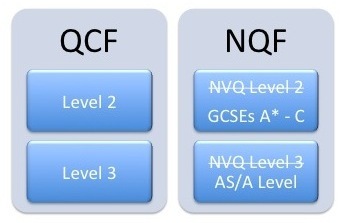 QCF level 3 is more advanced and equivalent to NVQ level 3 (also being phased out) and AS or A Level standard. *Some Local Education Authorities still request an NVQ as their preferred qualification, so check their requirements. 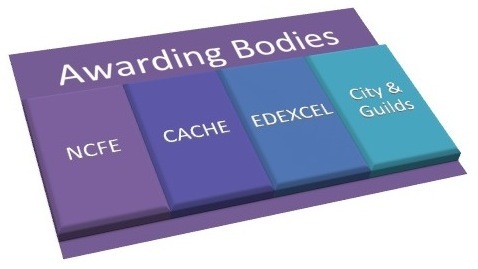 The main Awarding Bodies for teaching assistant qualifications are NCFE, CACHE, EDEXCEL and City & Guilds. Each will take the guidelines and units set out by the QCF and create qualifications for each level. Learning centres are the study colleges/centres which create the course set out by the Awarding Body, enabling students to qualify. Many provide home study packages, allowing students to complete coursework and other requirements from home, usually over the course of a year. Others will require college attendance for lessons and, depending on the course, some will ask for work placements. I have a level 2 Supporting Teaching and learning qualification. Since completing this course I have had a child who is nearly two and want to continue on to complete level 3. My problem is I don’t have the time to volunteer in a school so the Adult Education Service I completed level 2 with don’t have a course to offer me. The online courses I have looked in to don’t require a day placement and are either CACHE or NCFE – are these still a good qualification to obtain without the placement and will I still be able to get a job out of it at the end of the course? Any advice would be really appreciated as it is a mind field online. Thanks for your query. It’s a tricky situation to be in and one that many find themselves in. The online courses are good, but competition is fierce nowadays and experience is really key in our opinion. That said, you could contact your Local Education Authority and check what their requirements are. It may be that your level 2 is already suitable. When you child is old enough to go to pre-school, you could use that time to volunteer? Can you contact a few local schools and see what their views are? If competition for TA roles is low in your area, they may suggest the online course with a view to taking you on after completion?